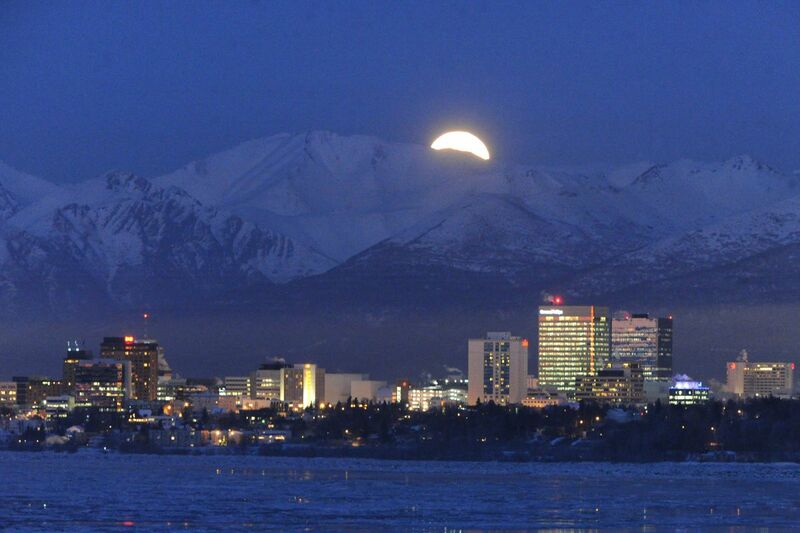 A full moon rises above the Chugach Mountains and the Anchorage skyline on Tuesday, Feb. 3, 2015. The U.S. economy is strong. People are working and businesses are profiting. Nice for the states that are doing good things for their residents, businesses and communities with the additional tax dollars. Alaskans should note that some states are boosting spending to deal with rising sea levels caused by climate change. Florida’s new Republican governor has proposed investing $2.5 billion to protect the Everglades. Louisiana’s Democratic governor wants to spend $55 million in state surplus revenues and about $300 million in oil royalty revenues for coastal and levee improvements. On a broader front, the strong economy is helping states tackle long-term problems, including education funding. West Virginia’s Republican governor has proposed using $150 million in surplus revenues to stabilize the state’s public employee health insurance program, which is stressing under rising medical costs. He also proposes a pay raise for teachers. “You had a state that was in real trouble,” Gov. Jim Justice was quoted in The Wall Street Journal on Feb. 1. “Today, the numbers are phenomenal,” he said of the improving economy that has boosted West Virginia sales and income tax revenues by 14 percent in the first six months of the fiscal year. Republican governors in Mississippi and Idaho want to use healthier tax revenues to boost teacher salaries. Combined tax revenues for all 50 states grew 7 percent last year, compared to the previous year, according to S&P Global Ratings. Washington state sales tax revenues, which are up significantly in a growing economy, provide about half of the state’s total tax dollars. The Democratic governor has proposed spending $1.1 billion for orca recovery and salmon-habitat preservation, intended to benefit the state’s ecosystem and improve water quality. The list continues of other states and how their residents are benefiting from strong economies and diversified income streams for the public good. Alas, we have but two streams in Alaska — one stream we cannot control, and one we bicker over incessantly. The actual Alaska economy adds only a trickle to that flow. The Alaska Department of Revenue in December forecast approximately $5.2 billion in unrestricted general fund dollars for the fiscal year that begins July 1. Of that, about 58 percent would be the annual draw on Permanent Fund earnings, as established by legislators last year. Almost 33 percent would be oil revenues. Coming in at a trickle would be 9 percent from all other taxes in total collected from businesses and individuals fortunate enough to live in a state that equates taxes to the plague. Alaskans can’t control oil prices, so there is little we can do about that revenue stream. Alaskans can’t do anything to boost Permanent Fund earnings other than fighting over the account, so the only thing we could do to that revenue stream is screw it up — either by taking too much from the fund and watching it decline in value, or pushing to invest in bad ideas because we think we know more than Warren Buffett. That leaves the only thing under our control, the trickle of general tax dollars. If we really want to build a better state, what about contributing to that effort with something from our own pockets and from the pockets of non-resident workers and visitors. Without some form of general taxation, it doesn’t matter how much we diversify Alaska’s economy with new jobs, new businesses, new products, new anything. Unless that new something produces a barrel of oil, there’s little to nothing new coming into the state treasury to pay for public services. It’s not only a disconnect, as economists have called it for years, it’s delusional — a delusional diversification. Nothing more for schools, troopers, roads or public health, no matter how Alaska may diversify and grow in the years ahead. Options include a statewide sales tax, a personal income tax, and a change to our state corporate tax to bring it into the 21st century by applying it to the popular business structures of limited liability companies, S corporations (non-publicly traded corporations) and other such businesses that exist tax-free in the state. Until Alaskans are willing to discuss taxes, truthfully and free of political slogans, that revenue trickle will never amount to enough to make a difference in the future of our state. And economic diversification will not do anything to pay for the public services we need.